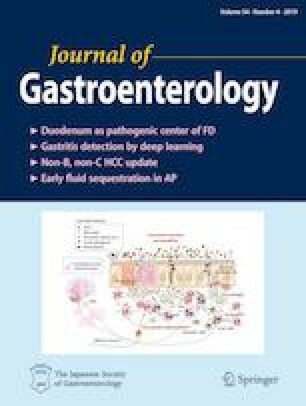 Anti-tumor necrosis factor (TNF) therapy induces and maintains clinical remission in patients with Crohn’s disease (CD). However, the effect of anti-TNF therapy on the natural course of CD remains controversial. We aimed to investigate the effect of anti-TNF therapy on the initial intestinal surgery for CD. In this single-center retrospective cohort study, clinical course of 199 CD patients of inflammatory type at the initial diagnosis (the period between 1973 and 2014) was precisely reviewed until the end of 2016. Patients were divided into TNF and non-TNF groups based on anti-TNF agent use. After comparisons of clinical characteristics and medical treatments, propensity scores were calculated for covariates. Risk of intestinal surgery was compared by a Cox proportional hazards model using the propensity scores. The effect of immunomodulators on initial intestinal surgery was assessed in the TNF group. During the study period, 108 patients received anti-TNF therapy. The patients in the TNF group were diagnosed more recently, and more frequently had isolated colonic involvement, and perianal disease. Immunomodulators were more frequently used in the TNF group. Cumulative probability of initial intestinal surgery was significantly lower in the TNF group (P < 0.0001). The hazard ratio in the TNF group was 0.32 (95% CI 0.13–0.74). Immunomodulators did not decrease the risk of initial intestinal surgery. Anti-TNF therapy can decrease the risk of intestinal surgery among patients with inflammatory-type CD at the initial diagnosis. Further studies should be necessary to determine the additive effect of immunomodulators on the risk of intestinal surgery. The authors received generous statistical support from J. Kishimoto, a statistician at Kyushu University, Fukuoka, Japan. Motohiro Esaki received research grants from, Mitsubishi Tanabe Pharma (MTP), EA Pharma (EAP), AbbVie GK (AGK), ZERIA Pharma (ZP), and Asahi Kasei Medical (AKM), and lecture fee from MTP and AGK. Takayuki Matsumoto received research grants from MTP, EAP, and Nippon Kayaku, and lecture fee from MTP, EAP, KYORIN Pharma, AGK, Janssen Pharma, Mochida Pharma, Pfizer, ZP, and AstraZeneca, and advisory fee from JIMRO, Kissei Pharma, and Takeda Pharma (TP). Takanari Kitazono received research grants from Daiichi Sankyo (DS), TP, MTP, Astellas Pharma, Chugai Pharma, MSD, Boehringer Ingelheim, Bristol-Myers, Kyowa Hakko Kirin, AKM, Otsuka Pharma, and Torii Pharma, and lecture fee from DS. The remaining authors disclose no conflicts of interest. This study did not receive any financial support.